What can I reuse or recycle to make small seed envelopes? | How can I recycle this? What can I reuse or recycle to make small seed envelopes? Basically, I want to make some small envelopes/pouches for sharing spare seeds at a seed swap. I imagine I’ll make them using scrap paper (old envelopes seem a logical place to start but I’m open to other suggestions) but I don’t know how will be best to go about making them. I usually just use a complete old envelope (one of the bigger-than-A5 ones that the banks use, since that’ll all I really get through the post these days) – but the seeds only take up a tiny amount of space so that’s convenient but excessively bulky. And since I’m giving them away, I’d like them to be a bit neater/fit for purpose if possible. They need to be reasonably tightly made (since some of the seeds are very small and will fall out of holes) and, if possible, resealable in some way (even if it’s just having enough space at one end to be folded over firmly a few times). Ideally they’ll be water resistant too. The wonderful Mary Horesh suggested a great how-to for making super cute envelopes out of a square of paper – so that’s one idea. Any other how-to suggestions? And any ideas/advice about what paper to go for or avoid? I’m imagining anything pulpy like newspaper or cheap book paper will be a no-no because they’ll absorb water rather than resisting it. How about using old medicine containers or those little containers that spices come in? If they’re supposed to keep the original contents dry then they’ll be fine for seeds. I used to use wrapping foil – that way you can use as much or as little as needed & tin foil folds up much tighter than paper. I like using plastic Tic Tac boxes or others designed for small candy. I can see inside, put on a masking tape label, and it’s reclosable. Hi, I used tissue paper to wrap my seeds that I was swapping in, in neat folded squares, then selotaped them down and put them in an envelope. Which i then decorated with rubber stamps, pictures out of old magazines, and pressed leaves.They dont need to be new envelopes as they are supposed to look rustic. These I swapped with friends or gave as presents to people. What about the small packages that seasonings / breadmaking yeast sometimes come in they would be good for small amounts maybe? I save and share seed. I use business envelopes– they can be from incoming mail, or any that had stuck shut. You can reuse outer envelopes by opening them at one end. You can reuse reply envelopes you don’t need to send by sealing and cutting across the narrow way in the middle to yield two halfsize ends (cut edge is the top). I just put in seeds and then fold the top twice. I label along the bottom edge. Extra space doesn’t hurt, it’s easier to get out the wanted number of seeds. I then keep multiple envelopes in glass jars with sealed lids to control humidity. This is a lot more compact way to store than using various jars and plastic containers, whose closures are not very airtight. I have been using a box of envelopes that was discarded because a business changed its name. 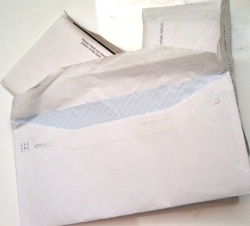 Businesses often pitch unused envelopes when they move or redo a logo. Also, you could ask local printers if they have any envelopes that have stuck or from rejected jobs. If you really want to get rigid containers, you can get lots of film canisters by asking at film processing stations in drugstores or walmart- go late in the day on weekends for best results. I have just recently finnished a packaging uni project, which i looked into plastic zip seal bags, bothe kenco coffee and cathedral city cheese use these types of packaging and they are still useable for resealing after the content has gone, this would be perfect for you. Start with a rectangular piece of previously used paper, notebook / copy paper weight. Size depends on number / size of seeds. Now fold up one end approximately 1/3 of the length of your paper tube and flatten it. Pour seed into top of flattened tube. Fold both top corners inward towards center by about 1/4. Tuck narrowed top portion downward into previously folded upward piece. Won’t unfold, needs no tape. P.S. – paper is the best for storing seeds. 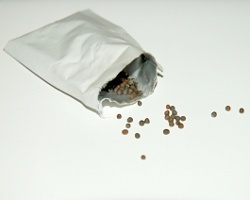 Plastic retains moisture and even small amounts can result in mildewed seeds. 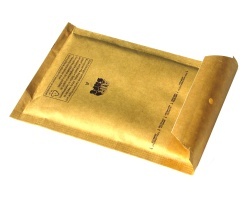 Commercial foil packets have often been processed with a dry, non-oxygen gas sealed in with seeds. Cloth bags work if you are storing very large seeds such as acorns. Keep paper seed packets cool, dark and dry. Ideal is a clean glass jar with screw-on lid. Put paper seed packets into jar, add a silica gel packet such as found with newly purchased electronic equipment or some vitamins. Cap jar and place in refrigerator.